There was a time, back when the United States was young and the robber barons were just starting to come into their own, when fortunes were made and lost importing luxury goods from China. It was a secretive, glamorous, often brutal businessâ€”one where teas and silks and porcelain were purchased with profits from the opium trade. But the journey by sea to New York from Canton could take six agonizing months, and so the most pressing technological challenge of the day became ensuring oneâ€™s goods arrived first to market, so they might fetch the highest price. 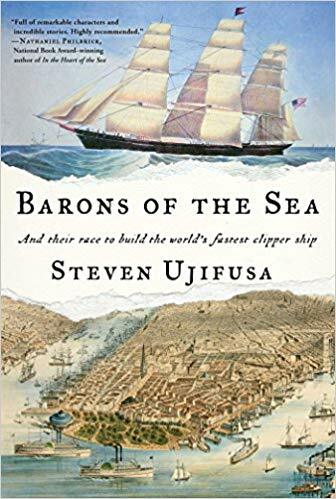 Barons of the Sea tells the story of a handful of cutthroat competitors who raced to build the fastest, finest, most profitable clipper ships to carry their precious cargo to American shores. They were visionary, eccentric shipbuilders, debonair captains, and socially-ambitious merchants with names like Forbes and Delanoâ€”men whose business interests took them from the cloistered confines of Chinaâ€™s expatriate communities to the sin city decadence of Gold Rush-era San Francisco, and from the teeming hubbub of East Bostonâ€™s shipyards and to the lavish sitting rooms of New Yorkâ€™s Hudson Valley estates. Elegantly written and meticulously researched,Â Barons of the Sea is a riveting tale of innovation and ingenuity that draws back the curtain on the making of some of the nationâ€™s greatest fortunes, and the rise and fall of an all-American industry as sordid as it was genteel.